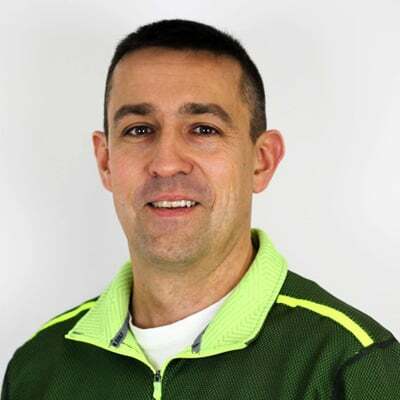 Just as there is significant diversity among granular fertilizer and soil amendment products, there are many ways in which these products can be produced. Whether producing a single nutrient product, a multi-nutrient complex fertilizer, organic-based fertilizer, or soil amendment, the process configuration for a given application is often based on a highly flexible approach to granulation centered around several key pieces of equipment. 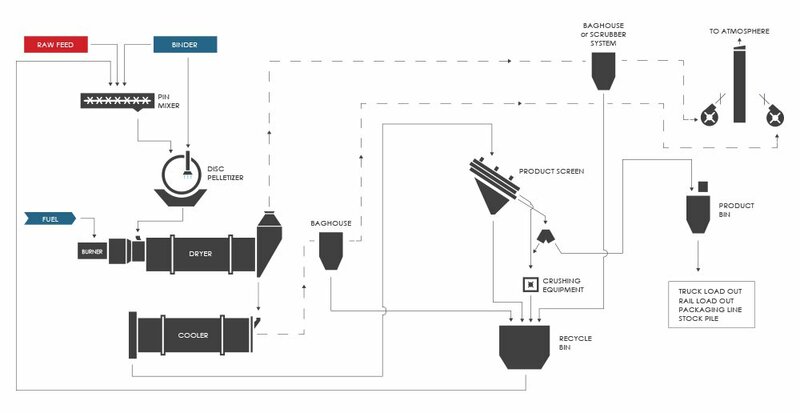 This approach is designed to respond to the unique characteristics of the feedstock in order to produce a product with the desired specifications in the most efficient way possible. For this reason, an overview of each piece of key process equipment is provided below. A look at how these pieces of equipment are combined into systems follows the equipment summaries. Several pieces of equipment prevail in the commercial production of granular products for use in agriculture, whether they are considered more traditional, or specialty. The equipment listed here is highly customizable and adaptable, and as mentioned, can be combined into various configurations in order to produce a product to exacting specifications. Granulation drums, also called granulators, are a type of non-pressure (tumble growth) agglomeration device. Incredibly versatile and with a high throughput, they are the centerpiece of many granulation operations – especially when working with a chemical reaction, high throughput, or long retention time. Granulation drums are used to produce a wide range of products, both organic and inorganic. Granulation drums work by tumbling material in a rotating drum set at a slight angle. Particles are tumbled on a bed of fines (recycle), while a binder spray system continuously sprays the particles so they become tacky and pick up more fines – a layering effect known as accretion. When a chemical reaction is involved, material inputs are pre-reacted and fed into the drum as a slurry. As the material cools and solidifies, the tumbling action rounds it into granules. A bed of recycle and binder spray system may or may not be used. due to a corrosive material. Coating drums are similar to granulation drums, but instead of granulating, they serve to coat granules with an additive. This might include an anti-caking agent, anti-dusting agent, or other performance- or handling-enhancing coating. Coating drums work much like granulation drums; the rotating drum imparts a tumbling action on the bed of granules. As the drum rotates, a spray system affixed to the interior of the drum sprays the tumbling bed with the desired coating. The tumbling bed helps to evenly distribute the coating throughout the granules. Pipe reactors are an optional component in some settings employing a granulation drum with a chemical reaction. Pipe reactors are integrated into the granulation drum and serve to react the materials, as opposed to reacting them in pre-neutralizing tanks prior to the drum. The benefit to pipe reactors is that they allow the heat of the reaction to be captured and used to flash off moisture from the granules in the drum, significantly reducing the energy requirements of the downstream dryer. Pipe Reactors are simply an acid-base reaction vessel into which the reactionary constituents are fed. The produced hot melt is then sprayed into the granulation drum, again, cooling and solidifying into granules as it tumbles. Disc pelletizers, or pan pelletizers, or pelletizing discs, are another non-pressure agglomeration device. 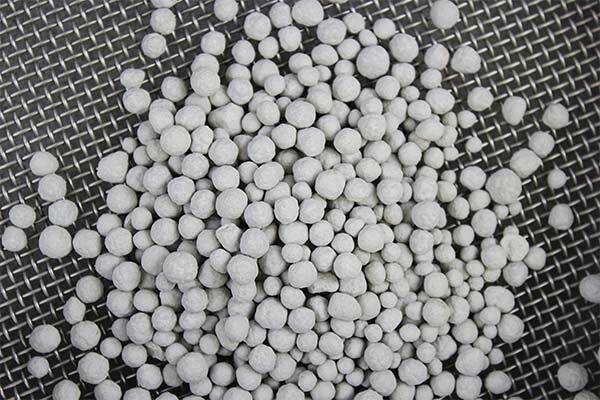 Granules (or “pellets”) produced in this manner are often referred to as having been pelletized. Disc pelletizers promote a tighter window of particle size distribution and can be used to create a very refined spherical product. Disc pelletizers work by tumbling material on a rotating disc in the presence of a liquid binder. As in the granulation drum, the continuous addition of fines and binder causes the particles to become tacky and pick up additional fines as they tumble. This allows the pellets to “grow” to the desired size, at which point they exit the pelletizer. Pin mixers are a type of medium-shear industrial mixer. In the agriculture industry, they are ideal for processing finely divided solids such as chicken litter and are especially adept at combining finely divided solids with a liquid binder. 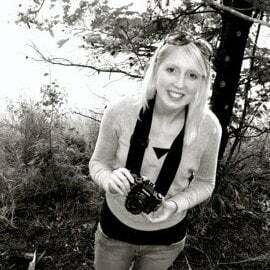 They may also be used to create “micro pellets” of minerals or nutrient combinations. Pin mixers can be used as a stand-alone agglomeration device, or as the preconditioning step in a disc pelletizing or granulation drum setup. Pin mixers are comprised of a rotating cylinder affixed with rods (or “pins”), inside a stationary shell casing through which feedstock and binder are continuously fed. This type of mixer employs an intense spinning action to form agglomerates (called seed pellets when preceding a disc pelletizer or agglomeration drum). This motion also densifies the material. in a disc pelletizer or rotary drum configuration. Pug mills utilize a gentle, kneading and folding over motion to thoroughly mix feedstock materials into a homogeneous mixture. Because of this type of motion, pug mills are ideal for combining solid and liquid feeds in heavy-duty processing applications where the feedstock is more of a sludge or slurry. They are frequently utilized when working with digested dairy manure. Hammer mills are used for grinding down over-size pellets so they can be reintroduced into the process as recycle – a critical component in many fertilizer and soil amendment production operations. product. Unlike many other types of hammer mills, which use a grinding or pulverizing action to break down material, FEECO hammer mills utilize a cracking action. Rotary dryers are an industrial drying system prized for their high capacity, heavy-duty build, and reliability. Rotary dryers are a forgiving piece of equipment, known to tolerate variance in feedstock moisture and particle size distribution – often a given in many fertilizer or soil amendment applications. Rotary dryers reduce the moisture content of the product to the desired level. Rotary dryers work by tumbling pellets in a rotating drum as a drying air moves through the drum. Flights, or material lifters, pick up the material, carrying it over, and dropping it through the air stream as the drum rotates to maximize heat transfer efficiency. The tumbling action imparted by the rotating drum offers the added benefit of “polishing” the pellets—further rounding them as they dry. Rotary coolers are an industrial cooling system used to reduce the temperature of material exiting the dryer. Cooling helps to prevent caking issues during storage and also mitigates the potential for damage to downstream equipment resulting from a hot material. A cooling step may or may not be used depending on the subsequent processing or handling required. Rotary coolers work very similarly to rotary dryers; material is tumbled in a rotating drum, while flights pick up the material and cascade it through the air stream. Instead of heated air, chilled or ambient air is used. The aforementioned equipment serves as the basis of most granular fertilizer and soil amendment production operations. Here, we’ll overview some of the most common ways in which these pieces of equipment are combined to create the systems used for producing both traditional and specialty granular fertilizer and soil amendment products. It’s important to recognize that these processes are highly flexible and are often customized to serve the specific needs of the task at hand. 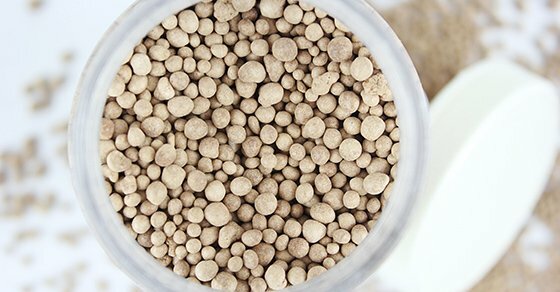 In the traditional (and still widely used) approach to fertilizer production, the feedstock components (for example, gaseous ammonia and phosphoric acid in the case of MAP or DAP) are reacted together to form a pre-neutralized, or partially ammoniated slurry. The slurry is then tumbled in a granulation drum where the reaction completes and the tumbling action rolls the material into pellets as it solidifies. 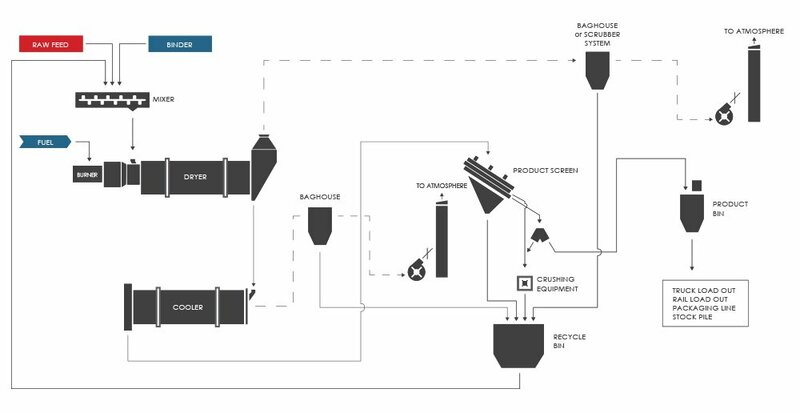 As can be seen in the diagram, material exiting the granulator moves on to drying in a rotary dryer. 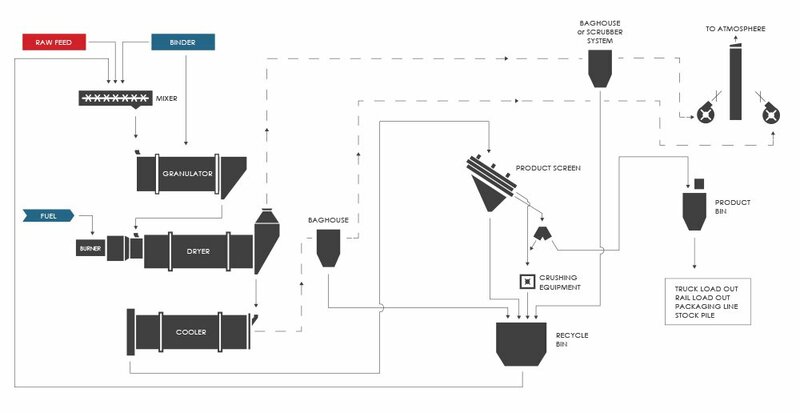 A screen classifies the particles, allowing on-size product to move on to cooling, while directing over-size product to a hammer mill for crushing. Cooling is carried out in a rotary cooler and helps to bring down the temperature of the material, which helps prevent caking, creates a more stable product, and mitigates the potential for any heat damage to downstream equipment. A coating drum may be used to apply coatings to improve product performance or control release properties. The crushed over-size material is combined with the under-size material from the screen and reintroduced to the process as recycle. This approach is well established and offers straightforward, reliable and consistent production. In some settings, a pipe reactor can be integrated into the granulation drum for a modified approach to the traditional method of granulation. This technique is very similar to the previously described process, but in this case, feed materials are reacted within the pipe reactor instead of in pre-neutralizing tanks. The hot melt produced from the reaction is sprayed into the granulator and the heat resulting from the reaction helps to flash off moisture from the granules. 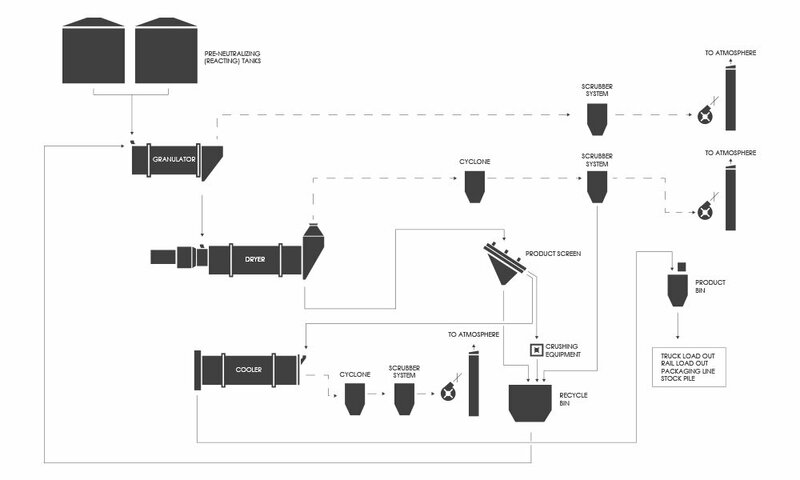 Product then moves on to drying, screening, and cooling, as shown in the diagram below. This approach to granulation is very advantageous, because it allows the heat of the reaction to be captured and utilized, significantly reducing the energy requirements of the downstream dryer. When a chemical reaction is not required, raw material is typically first fed into an industrial mixer – either a pin mixer or pug mill – in order to create a homogeneous mixture of the feed components and binder. 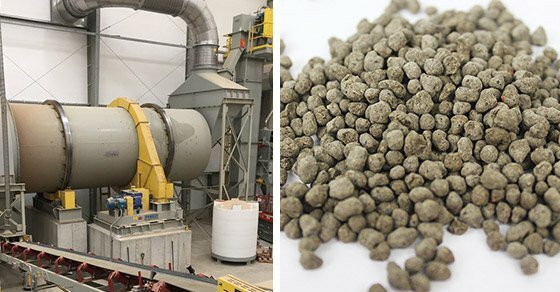 The mixture of newly formed seed pellets is then fed into the rotating drum, where additional binder is sprayed onto the tumbling bed of material, causing the particles to become tacky and pick up more fines. Drying and if necessary, cooling, follows, as shown in the diagram below. In the mixer-dryer approach, the pug mill serves as the sole agglomeration device. 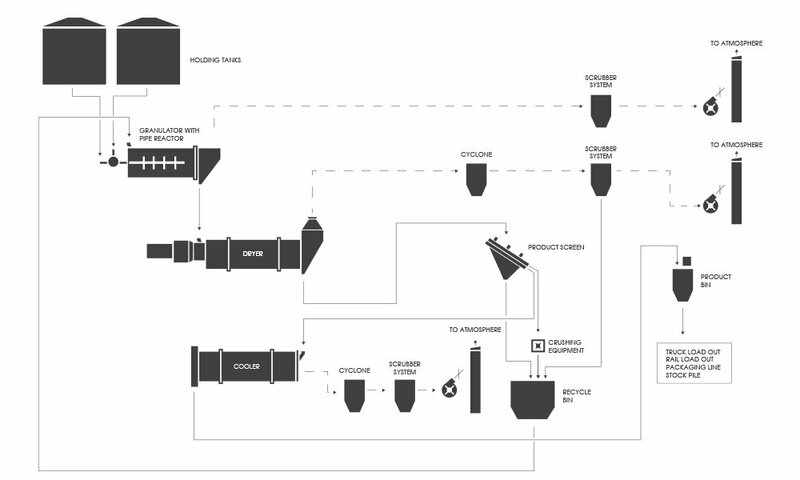 As shown in the process flow diagram below, an industrial mixer is continuously fed with raw feedstock and binder. The mixer works to promote a homogeneous mixture of feedstock components and binder, and also agglomerates the material. The particles exit the mixer and are fed into a rotary dryer. Here again, drying may be followed by cooling. This approach is used with high moisture materials such as animal manures. The mixer to dryer approach is advantageous because it is a simple, closed system; control is easy, and it does not require a lot of special knowledge or skill if the feedstock is properly preconditioned. Things like speed, pin/paddle arrangement – can be adjusted to vary the size of the desired pellet. It can also accommodate many different feedstock components for a highly customized product. When using a pin mixer to produce small agglomerates in the mixer-dryer setup, this technique may be considered micro pelletizing. “Micro pellets” are a popular choice in commercial landscaping and turf applications, as the small particles sink between grass blades so as not to detract from the appearance of the turf. They also offer faster product breakdown. In an approach similar to the mixer to dryer method, a disc pelletizer is incorporated into the process after the mixer, and before the dryer. Implementing a disc pelletizer in the process adds an element of fine-tuning and control over the end product. Things like spray locations, scrapers, incline, and speed, are all methods of optimization with a pan pelletizer, and help to offer enhanced control. In this approach, the mixer preceding the disc pelletizer serves as a preconditioning step, homogeneously mixing the binder and feedstock. Preconditioning ensures a uniform mixture of the feed components is produced, so the end product is uniform in quality. This step is also used to form “seed pellets.” Seed pellets are the beginning agglomerates that, when fed onto the disc pelletizer, continue to pick up fines and “grow” via coalescence. In general, adding a pelletizer to the process improves efficiency and quality of the end product; not only does a pelletizer create more on-size product, but the product is a little more dense, and has a more refined shape, as opposed to when solely a mixer is used, where the end product can be slightly rougher. Discs are also flexible with the addition of binders. 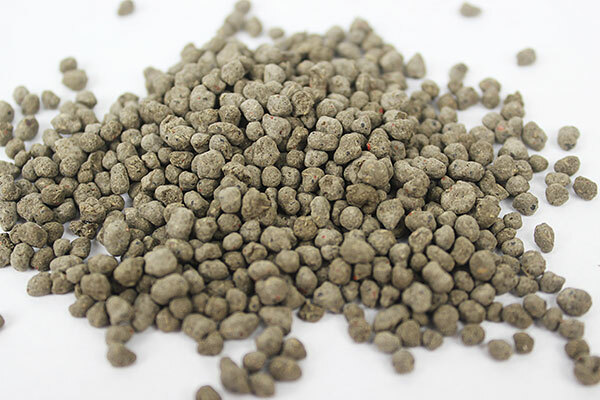 This method of granulation, often called pelletizing, is especially popular, because it creates a premium product. The produced granules are not dusty, allowing for easy handling and application, but are still capable of breaking down under standard field conditions. This method is frequently used to produce limestone and gypsum soil amendments. Disc pelletizers can also be used as a stand-alone device (without the mixer), but this is not as common, because it is a more time-consuming approach to granulation, because densification is created gradually through the addition of binder, rather than through the medium-shear action employed by the mixer. Testing in a facility such as the FEECO Innovation Center can also be an invaluable tool in working out process variables and developing a recipe for scale-up around your unique material. FEECO has been the premier name in fertilizer and soil amendment production since 1951. Not only can we offer complete process solutions and individual pieces of custom equipment, but we can also assist in process and product development through batch and pilot testing in our Innovation Center. For more information on our fertilizer production system capabilities, contact us today!